THE cabinet appointed by President Emmerson Mnangagwa last week dubbed the "dream team" by government publicists, though a marked improvement from previous ones, has shortcomings as it features ministers dogged by allegations of corruption, while in some cases the appointments were based on patronage and factional considerations - make it an average team. 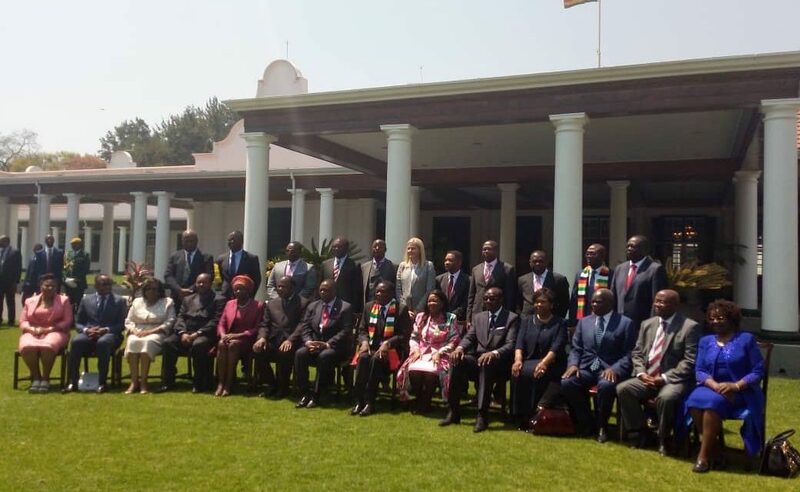 Mnangagwa appointed a 20-member cabinet on Friday last week fronted by renowned financial expert Mthuli Ncube, who was chief economist and vice-president of the African Development Bank, as Finance minister and swimming sensation Kirsty Coventry, who was appointed Sports minister. The two are seen as brilliant appointments. As chief economist of AfDB, Ncube, who distinguished himself in academia and the corporate world, oversaw the Economics Complex, which is focussed on the process of knowledge management within the bank and with its partners. He also superintended over the general strategic economic research within the financial institution. Coventry is a member of the International Olympic Committee athletes' commision and is widely acclaimed as Africa's best-ever Olympian, with seven medals. The appointment of Joel Biggie Matiza as Transport minister has also been lauded as he is a relatively successful professional and businessman in his own right, thus has the credentials to lead the ministry. Mnangagwa dropped senior members of his previous cabinet, including Patrick Chinamasa, Obert Mpofu, Simbarashe Mumbegegwi and Simon Khaya Moyo, re-assigning them to work for the party on a full-time basis. He also appointed Oppah Muchinguri-Kashiri as Defence minister, taking the portfolio away from Vice-President Constantino Chiwenga. Assigning Chiwenga to the Defence ministry was also in violation of the constitution. The appointment of Muchinguri-Kashiri is viewed as a move to neutralise Chiwenga's influence in government as the power struggle between the two escalates. The cabinet selection has been applauded in many quarters with even opposition leaders like David Coltart adding to the chorus of approval. "Brief comment on new Zim Cabinet—good that it is only 20, no Mpofu or Chinamasa, good Finance and Sports ministers in Ncube and Kirst Coventry," Coltart wrote on microblogging site Twitter. "So overall an improvement on the last one. I am always happy to give credit where it is due." However, despite the positive noises about the cabinet, there are a number of appointments that have raised eyebrows. Questions continue to swirl over the qualifications of Obadiah Moyo, who was appointed Minister of Health. He is accused of fabricating his qualifications and, when journalists asked him to clarify the matter, he declined to comment. In a classified cable from 2008 titled Collapse: Zimbabwe's Health Care System, the United States embassy in Harare raises doubts over Moyo's qualifications. "Moyo's business card indicates he has both a PhD and a medical degree. After our initial meeting, we learned that he earned neither. Rather, he was Sally Mugabe's dialysis technician at Parirenyatwa throughout her long struggle with a kidney disease. After Sally's death, Mr Moyo suddenly became Dr Moyo, and in 2004 he became CEO of Chitungwiza Hospital," the cable read. There are questions, for instance, over his Master of Philosophy degree in Medicine which he claims to have attained at the University of Zimbabwe. There is no mention of such a degree programme at the institution. Moyo's credentials are being questioned at a time the country has been hit by a cholera epidemic, raising further questions on Mnangagwa's pick for the ministry. The retention of July Moyo to the Local Government portfolio after he lost the Redcliff parliamentary election is seen as evidence that patronage was a major factor in the appointment of cabinet ministers. July Moyo is considered Mnangagwa's right-hand man and one of the strategists in his Zanu-PF faction. July Moyo's ill-fated decision to bar commuter omnibuses from entering Harare's city centre had disastrous consequences with commuters forced to walk long distances to get to their destinations amid howls of protest. The decision was shelved after just one day. One of Mnangagwa's allies, Joram Gumbo, was appointed Energy minister despite being entangled in the aircraft purchase scandal which involves state-owned Air Zimbabwe and controversial airline Zimbabwe Airways) whose ownership is dodgy when he was Transport minister. Gumbo's reappointment of Eric Gumbi and Angeline Karonga to the Zimbabwe National Road Administration board as well as Civil Aviation of Zimbabwe boss David Chaota also clouded his tenure as Transport minister. Some of these individuals at the two institutions had been removed after allegations of corruption and other irregularities had been raised against them. Nqobizitha Mangaliso Ndlovu, who was appointed Industry minister, has virtually no experience to run the portfolio, raising issues of patronage. This has raised concerns at a time industry is beset by a number of challenges which include obsolete equipment and foreign currency shortages which would need an experienced technocrat to steer the troubled ship. His appointment is believed to be based on political patronage, given that his father Richard Ndlovu was a longstanding Zanu-PF politburo member. Ministers such as Muchinguri-Kashiri and Sithembiso Nyoni have been part of previous cabinets and have no track records of delivery. Business consultant Simon Kayereka said some of the appointments could turn cabinet, which has been dubbed the dream team, into a huge disappointment. "The so-called dream team could turn into a nightmare. The Local Government minister is a tried and tired cadre who has a mammoth task of turning a chiefdom into an efficient system that is free of political point scoring," Kayereka said. "Prof Ncube however will do a good job as long as the politburo does not issue directives and reversals, or stand in his way." Political analyst Dumisani Nkomo said although the cabinet is well-balanced, the retention of some failed ministers is a major drawback. "I think to be fair it is a fairly balanced cabinet. The disappointment for me is the appointment of the likes of Cain Mathema who have been a perennial failure," Nkomo said. Analysts say although the new cabinet is a mixture of youths, technocrats and experience, it also has appointees based on loyalty, patronage and cronyism who maybe an albatross around Mnangagwa's neck.